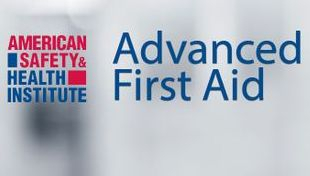 Advanced First Aid - AFA is a classroom, video-based, instructor-led course from American Safety & Health Institute that teaches students in non-EMS roles critical skills needed to respond to and manage a variety of emergencies such as Airway Management, Rescue Breathing, Soft Tissue Injuries, Shock, Muscle and Bone Injuries, Head and Spine Injuries, and Childbirth. AUDIENCE: This course is for anyone with limited or no formal medical training who needs a course completion card in first aid in order to meet certain job, regulatory, or other requirements. This course is NOT for Healthcare Providers, see our AHA Basic Life Support CPR course. COURSE FORMAT: This course is classroom-based which includes instructor, video, and skills interaction throughout the course. The course is approximately 16 hours (two days) in length for an Initial Course and 8 hours in length for a Re-certification course. CERTIFICATIONS: Upon completion of this course, students receive an ASHI Digital Certification Advanced First Aid completion card. If you prefer a traditional card, there is an additional $5.00 charge to the class cost. Certification cards are valid for 2 years.